Issue 10 (Jul - Aug 2003): "Them what dies'll be the lucky ones." Marx , Marx and more Marx pirates! 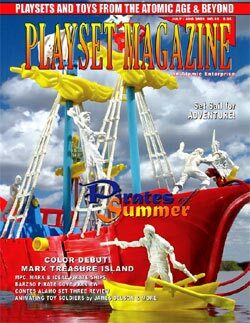 For the first time ever: ALL of our Marx VIP's are in on the story: Frank Rice the playset designer, Charles Marx the advertising genius, Al Bagg the designer from 62 - 71; Bucky the factory GM and Sy Wane, the VP of Marx!